One of my kids recently turned 17. I know, I know… and yes that makes me feel a bit old to some degree, but yet I still feel like I’m 17 sometimes as well. When asked what he wanted to do for his birthday, the answer was a simple ‘hang out with family and grill out’. I’m a fan of that. So I figured I would come up with a menu that I knew he would love; everything from grilled Filipino meats, to Filipino pancit, and a few other things in between. 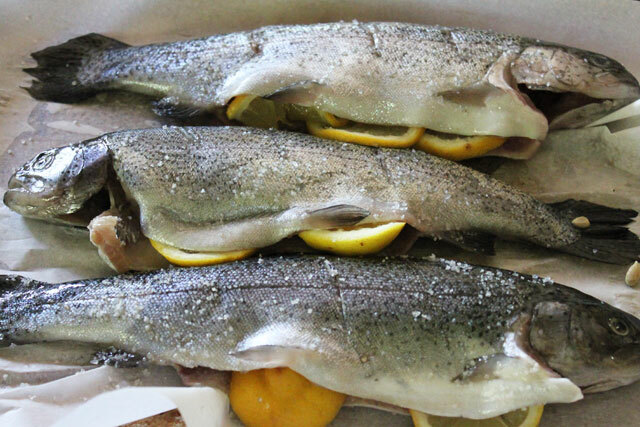 As I was getting some of the ingredients, I figured I would throw in some whole trout, and something that I thought I would make on his birthday, probably on the smoker, but it ended up being too much work, and I had to use that trout the day I purchased it. Let’s call it a prelude to his birthday. So instead of smoking the trout, I decided to stuff it and bake it whole. 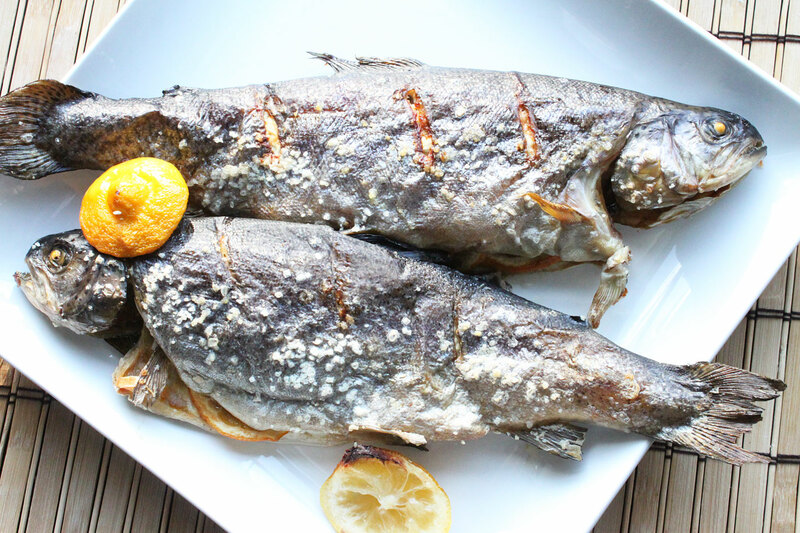 Wow was this baked whole trout not only super delicious, but really easy to make. That’s it. Pretty simple. But do not stop there if you don’t want to. Feel free to use other fresh herbs, garlic, or butter inside if desired. Me, I wanted simple and to taste more of the fish. Start by rinsing your fish and patting the inside and outside dry. Using your knife, make a few slits on top of the skin, working from the top to the bottom. Season the inside of the fishes with salt and pepper, and lay thinly slices of lemon inside of each one. Take some of the chopped parsley and add to the inside of the fishes as well. Take any remaining salt and season the outside of the fish. Drizzle the olive oil over the fish, and place onto a parchment paper lined baking sheet. Take any remaining lemon and place onto the baking sheet to be squeezed over the fish after cooking. Place into a 425 degree preheated oven and cook for about 20 minutes. The skin should crisp up a bit and the fish should be nice and moist. Plate and serve, squeezing any additional lemon juice onto the fish. The end result is great. It’s an awesome presentation on the table and gets everyone involved. Are there bones? You bet, so this is always a great exercise in how to remove bones, and playing caution when removing the filet from the bone. The trout is super light, moist, and really refreshing to eat. Everyone enjoyed the trout, and something different than smoking it on the smoker. Hope you enjoy!